Kerasoft IC (Irregular Cornea) is a soft lens specifically designed for the correction of the irregular cornea including keratoconus and post graft. It is available with both a standard and a sector management control (SMC) periphery, in which individual sectors can be flattened or steepened in relation to their neighbors. Kerasoft IC lenses are fitted according to the MOROCCO principle pioneered by Ultravision: movement of up to 2mm, no rotation of laser mark, centered, comfortable with stable VA. 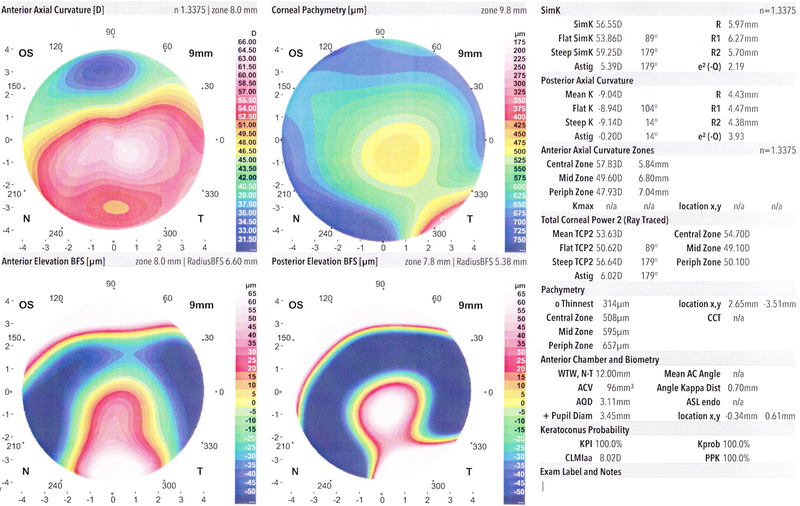 These two case reports illustrate that the Kerasoft IC lens is a versatile lens that can be successfully applied in fitting mild, moderate and even advanced irregular corneas. It can be a very useful tool when a lens is required in only one eye (case 1) or if the patient is having difficulties with RGP lenses (case 2). 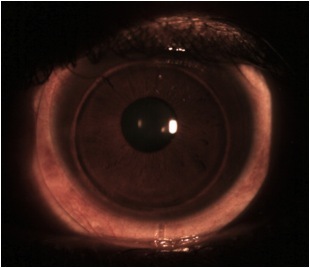 An 18-year-old male was diagnosed with keratoconus OD 1 year ago (figure 1). He is a student with an active extracurricular life including backstage work at a local theatre. His current RGP corneal lens fit well but resulted in variable vision. He was keen to undergo collagen cross-linking. Patient was happy with Kerasoft IC OD, which provided stable VA and immediate tolerance. A soft lens represented a good first choice lens in this case as it was for one eye only, it suited the patient’s social pursuits well, and was appropriate pre / post collagen cross-linking. 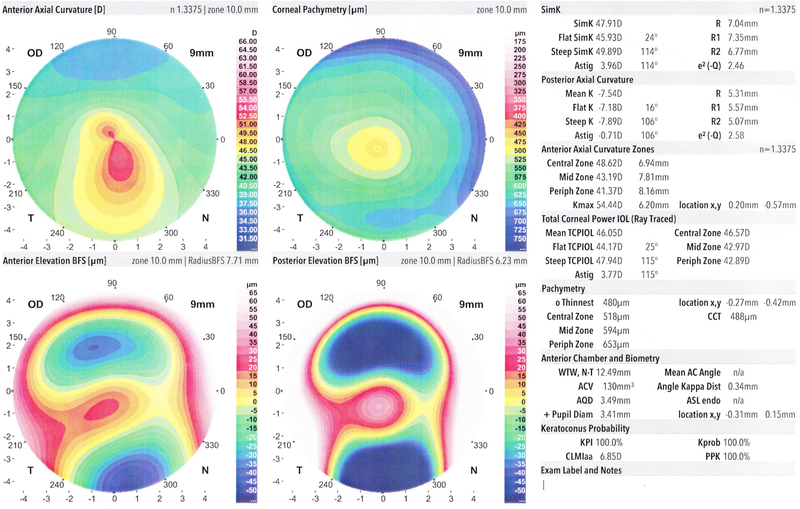 A 52-year-old male was diagnosed with keratoconus 12 years ago and was wearing corneal RGP lenses OU. 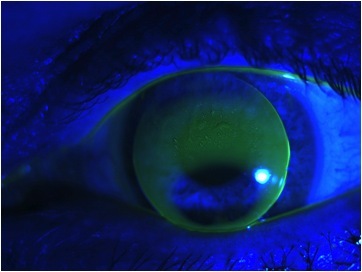 It had become increasingly difficult to fit his left eye due to advancing distension of the inferior cornea (figure 3). The patient has always been aware of poorer VA OS compared to OD. Recently he has experienced increasingly poor comfort, with the left lens popping out frequently (figure 4). The initial lens 8.40:14.50 was extremely mobile with fluting inferiorly, indicating a flat fit. Examination of topography (figure 5) indicated that a sector management control design may be necessary. Option 2: steepen the BOZR and flatten (FLT) the superior periphery, keeping the inferior periphery standard. Both options were tried in the eye and, in this case, option 2 provided the best fit. The patient was happy with Kerasoft IC OS, which provided slightly improved VA compared to previous RGP corneal lens with much less distortion and much improved comfort. The patient was keen to refit OD to Kerasoft IC as well. This case demonstrates that Kerasoft IC can be equally applied to more advanced cases of corneal ectasia including those that do not improve satisfactorily with conventional RGP lenses. Kerasoft IC is a versatile lens that can be successfully applied in fitting mild, moderate and advanced irregular corneas. In the author’s experience, the standard periphery design provides a satisfactory fit; however, in some cases, especially those with advanced or low cones, a sector management control lens is required. The soft material lends itself well to new fits, monocular fits, dusty and other challenging environmental / occupational conditions, when tolerance of RGP is a known issue, and when a satisfactory result is not achievable with other lens types. KeraSoft IC can also be used to rehabilitate the cornea before collagen cross-linking in cases where there are abrasions and / or oedema as a result of RGP lens modalities. Additionally, Kerasoft IC will flex to accommodate the corneal shape changes postoperatively, allowing patients to resume wear around two weeks after the procedure. Jennifer McMahon graduated in 1999 as a Dispensing Optician, then with First Class Honours in Optometry from Anglia Polytechnic University in 2003. Jennifer is currently Optometry Lead at The Great Western Hospital, Swindon, UK and is also Clinical Consultant for Innovative Sclerals Ltd. Jennifer spends much of her time training optometrists and other eyecare professionals in scleral lens fitting and has presented posters on the subject at BCLA, MCLOSA, ECLSO and HOAC conferences as well as at the Oxford Ophthalmological Congress. 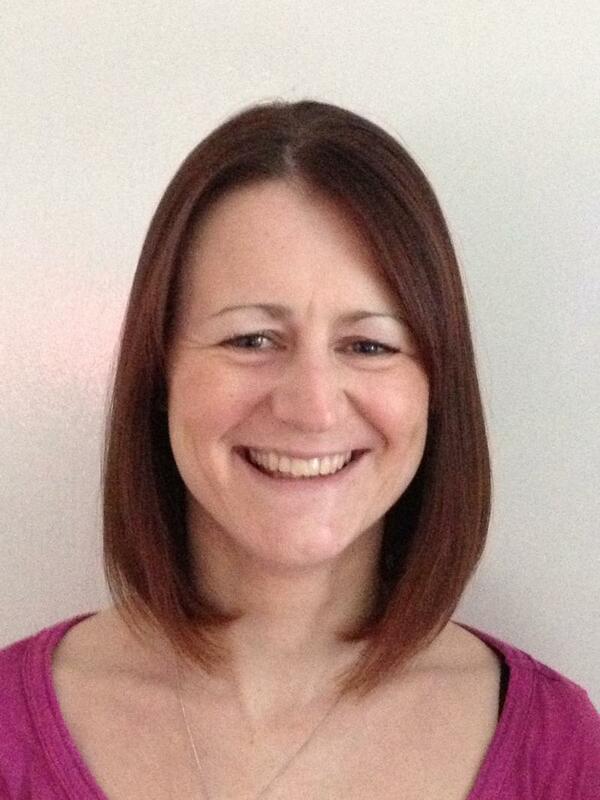 She has also held lectures and workshops for the BCLA at HOAC and for Optometry Masters / Moorfields Advanced courses.